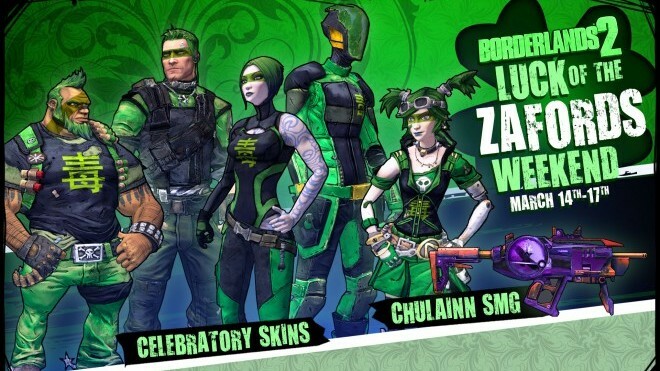 With St. Patrick’s day on the horizon, the folks over at Gearbox have prepped a new gear-up weekend event with the help of none other then the Zaford clan who will be counting their good fortune and luck, as you will too. As of today, there will be an increased drop rate of shields and their rarity. In addition, Gearbox has also released some Shift codes that will net you some sweet skins for you vault hunters, which will be available below. As well as throwing in the Maliwan Chulainn SMG, which is capable of devastating your foes with both Slag and Shock damage at the same time, the Chulainn will be automatically unlocked for the first character that you load up the game with and will be unlocked at their current level. Act fast, as these shift codes and increased drop rates will only be available until March 18th. Speaking of levels, the folks over at Gearbox have revealed that details about the long awaited level cap raise will be discussed during PAX East on March 24th, at 12:30 PM EST. They will also will be bringing with them more information about the upcoming sixth playable character, which you can watch the trailer for below. Are you excited that Gearbox is having another gear-up weekend? If so, let us know in the comment section what you will like to see have an increased drop rate in future gear-up weekends!